I have a little smile on my face realizing that the basics of genealogical research are critical. I hope to do the happy dance if all of this recent research pans out. Following up on members of a household is critical. You never know who might be related and how they are related. I have a specific goal to locate William Michael Murphy (born in Indian Territory), my great grandfather. 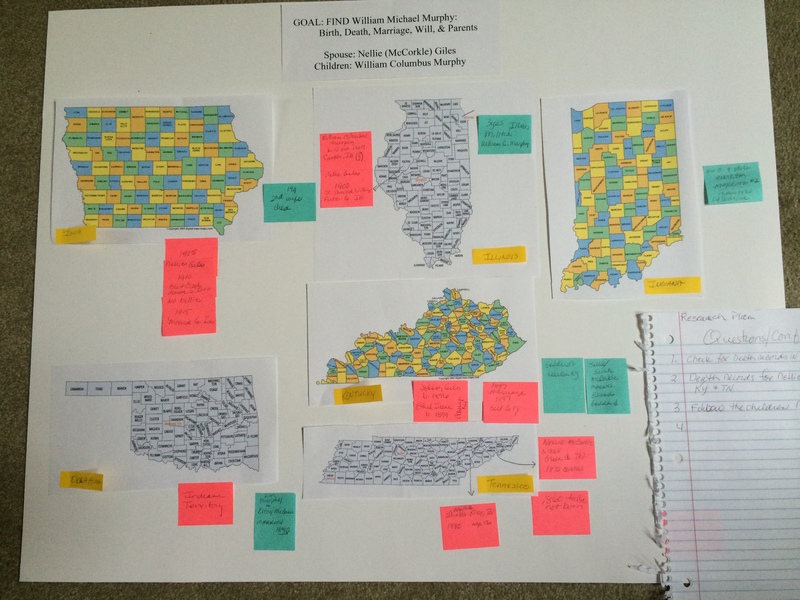 I resorted to using a poster board with county maps and details to help sort out where this man might of came from and where he died. Every time we think of a question or something doesn’t add up, we write it down on a piece of paper and that is the beginning of my research plan. I need to be able to research and resolve each question the best I can (following GPS steps). In order to research William Michael I also have to research my great grandmother Nellie McCorkle (b. 1866 in Greenville, TN). We assumed she was married to William Michael Murphy. So far my grandfather William Columbus is the only child of this union we can locate, but not likely, meaning there is more research needed. One census said that Nellie had five children, we can account only for three. I am not sure what happened to William Michael Murphy, but time will tell. Well, Ms. Nellie “Murphy” married a second time to Henry Giles, who came from North Carolina. Getting married as a Murphy is telling me they probably were married. They married in 1897 in Bell County, KY, why? Who knows! Nellie’s sister was near and Sarah/Sallie McCorkle, she married Edward Goddard, they ended up in Harlan KY. The Goddard line is another story. 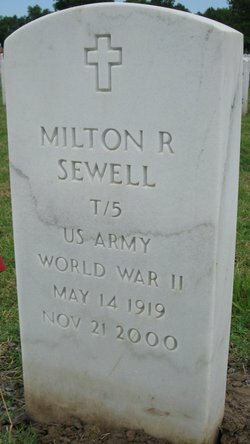 So following up on the son of Ethel Irene and John Albert Sewell, I located Milton R. Sewell on ancestry.com and family search, and it leads me to Find A Grave. I also see that he served in the military and passed in 2000. This is good news and gives me some more leads. But what I noticed on Find a Grave was a little posting on the bottom right. It was a note saying he, Uncle Milton was missed, etc., and it was from a niece. So first I search others on Find A Grave, sent an email and did a public posting to this person. Next I checked the name on Facebook. Boom! I located the niece and sent a message. Now I will prepare a list of questions to ask this niece since now I also know who her parents are. Her mother does not appear to be a Sewell or Giles. So this will be interesting.